Our first visit to Townhouse Detroit came before the weather turned cold, on a night when the roof was fully open to a warm, fresh evening air that drifted in and around us while we ate. The world passed by on the sidewalk outside, beyond the solid glass walls and a big patio primed up with trees and garden umbrellas. The lights from the surrounding skyscrapers provided a big urban night canopy feeling to the inside, viewed through an extraordinary large retractable glass roof — a scene worthy of a Chrysler “Imported from Detroit” commercial. Townhouse Detroit, which launched in July, is on the ground floor of One Detroit Center, on Woodward Avenue and Congress Street, just north of Jefferson Avenue. The kind of roof Townhouse boasts is a novelty in Detroit, though more commonly used in Europe. The French call it a verrière, which translates as “glass roof,” or more like a canopy. The famous old Lasserre, one of Paris’ top dining spots, has long had a cleverly disguised mechanical and retractable roof in its ceiling, which, when triggered mid-dinner, provides the great drama of almost sucking the whole room into the night sky to the pleasurable ooohs and aaahs of its well-tailored guests. And at Eataly, the Italian food and wine market emporium in New York, I noticed recently that its rooftop restaurant/brewery Birreria has the same type of sliding glass roof as Townhouse Detroit. 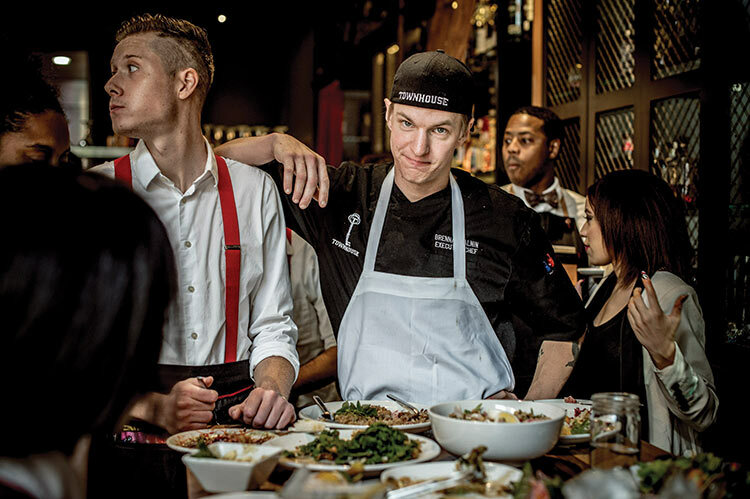 The atmosphere at Townhouse is sassy, with great people-watching in an impressive architectural atmosphere — and this is primarily what makes the place work so well. 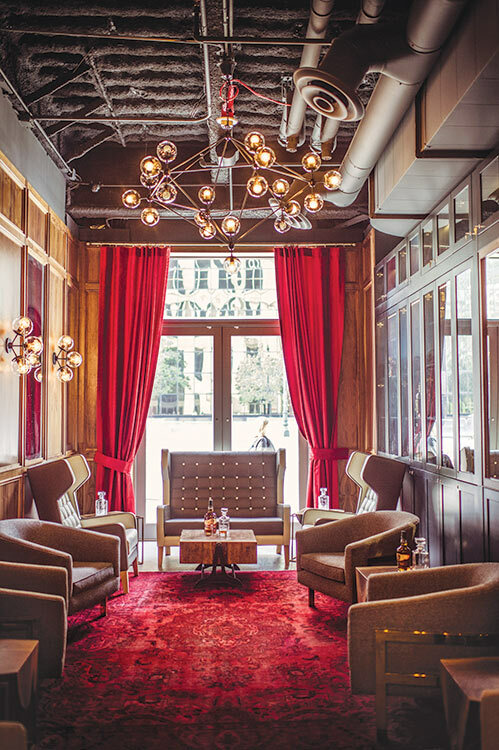 To spend an evening at Townhouse Detroit is to sink into a sparkling night cityscape in a lounge-y restaurant full of lively energy, a good vibe, constant motion, and the extremely cool views. Sasson’s Townhouse Detroit is sleek and snazzy, with its 300-plus seats of dining space spilling out street-side from inside the building and into that glass atrium the size of a very large and double-the-height greenhouse. There are two bars, the kitchens, and the main dining room, all inside the ground floor, but each are situated in such a way that the eye follows the flow outward to the atrium. The food is American brasserie style, dominated by hamburgers. “We see what we do as modern American comfort food,” says Sasson. “We want to keep it good and familiar.” But there are limits on what Townhouse Detroit can do, he says. “Also, we have to do what the market will bear,” Sasson says. And the market bears a lot of suburban visitors, looking for food that’s good, fresh, and familiar. An evening at Townhouse Detroit is to sink into a sparkling night cityscape that’s full of lively energy and extremely cool views. 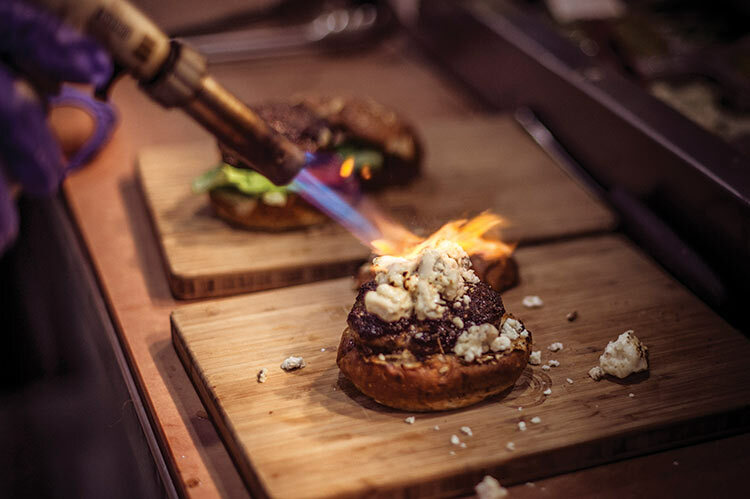 “We certainly see ourselves as progressive, but in the end there is a boundary in what I can put out in style or type of food and get a reasonable return,” Sasson says. Logically, comfort food fits that model. There’s also the need for an appealing nightlife scene, and that means a massive amount of specialty cocktails and an extensive spirits list. 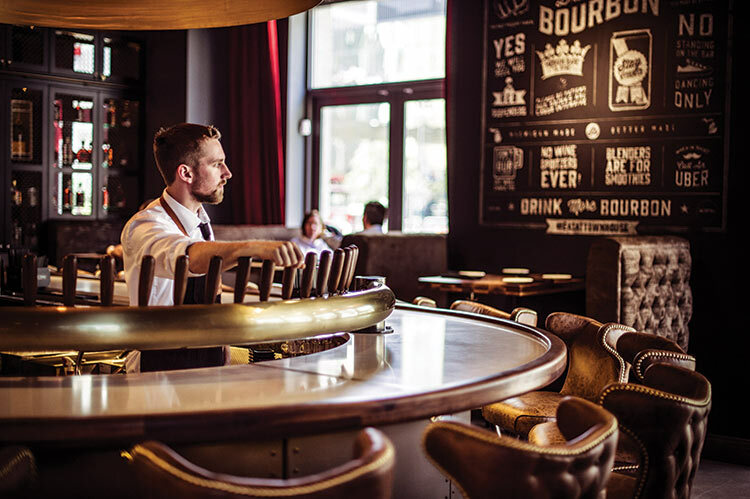 One bar, a large oval-shaped whiskey area, also has dining with high-top tables. Townhouse’s interior also features a long banquette and table seating offering a view into the open kitchen and the flurry of entertainment as chefs call out ticket orders to their stove staff, and servers pick up orders. A whiskey bar features an extensive spirits list. and ingredients, and are very attentive. Townhouse is outfitted with a mix of big, overstuffed poufy couches and solid café-style tables and straight back chairs in simple hardwood. 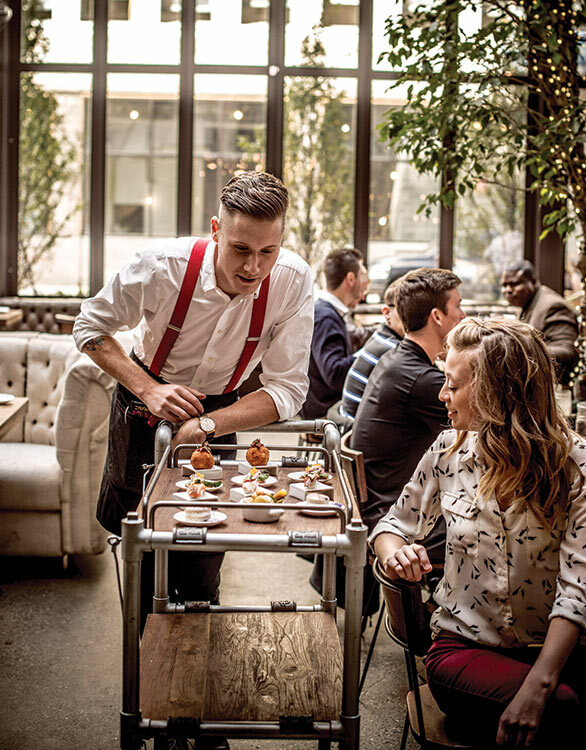 The restaurant also uses service carts that are rolled tableside to offer a selection of little starting dishes on arrival — those famous amuse-bouche — and to serve desserts at the finish. One quibble with the menu (this may be solely my problem) is that for dinner the food doesn’t rise to the same level as the place itself. It is an imbalance in an otherwise great dining experience. Comfort food includes a burger blended from 28-day aged steak cuts. As a lunch place, Townhouse Detroit and its menu work beautifully. But as you pass into the more intricate and intimate social hour of evening, most people’s aspirations and expectations for dinner slip into a different mode. Townhouse feels like it should have a more amped-up dinner menu. Instead, the menu takes a safe route centered on great comfort food, especially hamburgers — not that hamburgers are the only offering. Chef Brennan Calnin is clearly a good chef. Everything that came to the table was properly prepared and high quality. The menu has several pretty standard offerings. On both visits, we ordered Bucatini (effectively fat spaghetti) Bolognese, made with a creamy, thick lamb gravy, which was one of the better dishes. A Blackened Hanger Steak, served with smoked fingerling potatoes, beet greens, a warm bacon vinaigrette, and a blue cheese butter that you melt on the sliced pieces of steak, arrived exactly as ordered: singed on the outside, cold at the center. Pork & Beans is a bit tongue in cheek — pork cheeks that is — served with smoked kidney beans, creamed beet greens, and house relish. The Mac & Cheese was a little different: Boursin, mascarpone, and white cheddar in the cheese sauce, served on orecchiette pasta with a crunchy exterior coating from Parmigiano-Reggiano cheese. One issue: The notion is good and the flavors were right, but the texture was off. The pasta was overly thick and doughy. These quibbles with food aside, there are few other places I would put so high on my list for an evening in Detroit. Townhouse Detroit’s owner has created an exciting place here, but I believe that the food could — and should — be more adventurous, peppier, and on a level equal to the place itself. 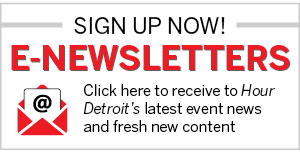 Meanwhile, it’s a must-see place and an inspiring evening in revitalized downtown Detroit. A dim sum cart rolls through the atrium. 500 Woodward Ave., Detroit; 313-723-1000. L & D Mon.-Sat., Br. Sun.